They are the grand old political families of Punjab. Both gave the state a Chief Minister each. And today, their progeny are vying for ticket to contest the assembly poll, just like countless others lobbying in Delhi. The People’s Party of Punjab (PPP) and the SAD-BJP combine is in a race to grab the support of Team Anna that had announced recently that it would campaign against the Central Government (read Congress) in the five poll-bound states. The PPP chief, Manpreet Singh Badal, said that a team led by Abhey Singh Sandhu, nephew of Shaheed Bhagat Singh, would soon meet Team Anna to ensure his support for the elections. To ensure maximum participation of the youth in the coming elections in the state, Chief Electoral Officer Kusumjit Sidhu today appealed the public in general and the youth in particular to get enrolled as voters after the final publication of voter list on January 2. There is panic in the BJP state unit with the party's national president Nitin Gadkari announcing that the party ticket would be allotted on the central leadership's assessment and not as per the list supplied by state leaders. Senior BJP leaders in Delhi indicated that the list of BJP nominees would be released on Monday, probably in one go. Several state leaders had already started campaigning in Punjab, anticipating that they would get the party ticket. Now, they are not so sure. With the delimitation exercise eating up one of the five constituencies, Naushera Pannua, in Tarn Taran district, SAD heavyweight Ranjit Singh Brahmpura would now be testing political waters from nearby Khadoor Sahib segment. Dharamkot is a rural-dominated assembly segment, which is now among one of those seats which is likely to bring up new faces. After the delimitation exercise, the constituency has been converted into a General Category seat. Apart from the two small townships of Dharamkot and Kot-ise-Khan, as many as 160 villages fall in this constituency. With all the aspirants for securing Congress ticket for the eight constituencies of Patiala camping in New Delhi, there is hardly any political activity in the district from the past a few days. A number of “self-acclaimed” VIPs in the state may lose their security cover as the State Election Commission is likely to depute the policemen attached with these persons on poll duty. Perturbed over non-acceptance of their long-pending demands, a large section of employees, working with the two power utilities of the state, under the banner of Technical Services Union (TSU), has announced to hold a massive protest demonstration at Lambi, the native village of Punjab Chief Minister Parkash Singh Badal on January 24 next year. While the fortunes for the kin of Beant Singh, who was killed in a terrorist attack, have been revived somewhat with Anandpur Sahib legislator Ravneet Bittu emerging as the face of generation next, the family still has to fall back on Pradesh Congress president Capt Amarinder Singh to get ticket for the other grandson, Gurkirat Singh Kotli. The family of the other former CM Harcharan Singh Brar, which has notched more political defeats than victories in the past decade, is now desperately trying to retain its family “fiefdom” of Muktsar. 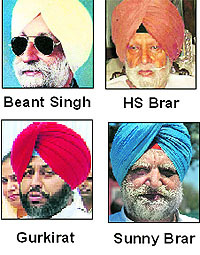 Of the two, Beant Singh’s family appears more favourably placed. However, even in their case, the family may get only one seat. Payal legislator and Beant Singh’s son Tej Prakash Singh has not even applied for party ticket. His sister Gurkanwal Kaur, a former minister, has applied from Jalandhar Cantonment, the seat from where she lost in the last elections. She is still in the race but with People’s Party of Punjab (PPP) defector Jagbir Singh Brar (sitting MLA from the seat), joining the Congress, she may find the going difficult. Party sources claim Kotli had bright chances of getting ticket from Khanna. He claims he had been working in Khanna ever since the family seat of Payal was reserved and that the Beant Singh’s “martyrdom” would work in his favour. Political observers said a Congress candidate may have an edge over SAD candidate from Khanna Ranjit Singh Talwandi, who was an “outsider”. Gurkirat, however, is facing stiff challenge from former PCC president Shamsher Singh Dullo, who too wants to contest from Khanna. In the Brar family’s case, things have become a bit complicated with the entry of PPP defector Kushaldeep Dhillon, a contender for Congress ticket from Faridkot. Kanwarjit “Sunny” Brar has been indisposed due to illness for quite some time and his wife Karan Brar has applied for Muktsar seat. Manpreet said Abhey Singh, Bhagwant Mann and other senior party leaders had participated in Anna Hazare’s protest in Delhi a few months ago. They had also addressed Anna’s supporters there. Anna repeatedly mentions Shaheed Bhagat Singh in his speeches to motivate supporters and volunteers. Team Anna’s Prashant Bhushan said it was clear that they would campaign against the Central Government in the poll-bound states but was yet to decide as to which party they would lend support to. “A decision in this regard will be taken at a meeting at the Anna’s native village next week,” Bhushan said. “Before taking any decision, we will examine the stance of various parties vis-à-vis the Lokpal and the Lokpal Bill,” he added. The Left parties had opposed the Lokpal Bill in its existing form in the Parliament but may seek Anna’s support for the elections. In Punjab, the Left parties are part of the PPP-led Sanjha Morcha. The SAD-BJP coalition is also trying to woo Team Anna. SAD spokesman DS Cheema said the Congress-led UPA Government stood exposed on the issue of Lokpal and corruption. He said the SAD had backed Anna’s mission and senior leader SS Dhindsa had addressed a dharna staged under the leadership of Anna in Delhi a few days ago. Those attaining the age of 18 years and above as on January 1, 2012, can get themselves registered as voters from January 2 to 4. In a statement issued here today, she said the total population of Punjab as per the Census 2011, is 2,77,04,236. During the period of summary revision, 7,33,832 new applications were received from new voters, of these, 7,23,424 were accepted. The total electorate strength at present is 1,74,33,332. The CEO said BLOs had been appointed in educational institutions as per the guidelines of the ECI to ensure the enrollment of students. The BJP will contest 23 of the 117 seats in alliance with the SAD. The BJP is depending on the assessment of party probables on the report of senior leaders from other states. General secretary JP Nadda, BJP's Punjab affairs incharge Shanta Kumar and co-incharge Capt Abhimanyu will also have a say. The BJP is also relying on a survey by an independent agency. 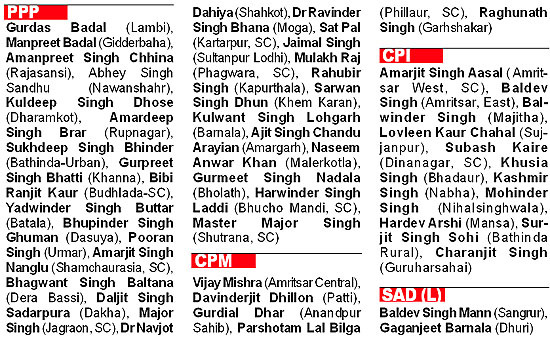 The seats for which only one name has been sent for consideration of the party high command are Sujanpur (Dinesh Baboo), Mukerian (Arunesh Shakar), Dasuya (Amarjit Sahi), Hoshiarpur (Tikshan Sud), Anandpur Sahib (Madan Mohan Mittal), Rajpura (Raj Khurana), Firozepur (SS Nanu), Amirtsar North (Anil Joshi), Jalandhar West (Bhagat Chuni Lala), Jalandhar North (KD Bhandari), Ludhiana East (SP Gosain) and Ludhiana West (Rajinder Bhandari). While Brahmpura (Naushera Pannua sitting MLA) is the SAD candidate, the Congress may field Ramanjit Singh Sikki, a wealthy farmer and businessman from Kapurthala who is the “blue-eyed boy” of former MP Rana Gurjit Singh. However, Congress leaders Pradeep Chopra and Bhupinder Singh Bittu have also been lobbying for the ticket. 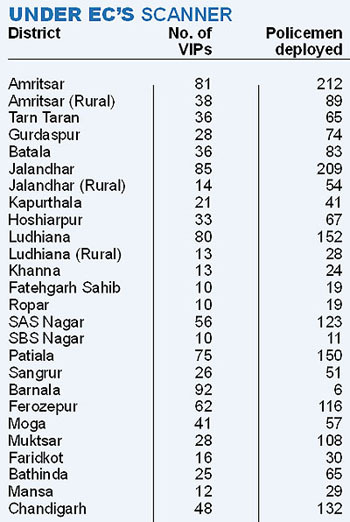 The profile of the new Khadoor Sahib constituency has changed much post-delimitation, with several villages from the constituencies of Naushera Pannua, Attari and Tarn Taran now falling in this segment. Promises and projects: Brahmpura has to his credit a new 60-bed hospital at Khadoor Sahib, new grain market at Goindwal and the regional centre of Baba Farid Medical University. He also claims credit for beginning of work of the GVK thermal plant at Goindwal, power grids at Raishiana and Chohla Sahib. Vox Populi: The opposition claims that though funds had been made available to panchayats, the MLA failed to hold the sarpanches accountable. "Several village panchayats got funds in excess of Rs 80 lakh, but the grants were misused. Development that could have been brought about through these funds is missing," says an opposition leader. The residents say the constituency had been ignored by successive governments. LOOKING BACK: Brahmpura is one of those political leaders who rose through the ranks from a village sarpanch to an MLA. A four times legislator, he has lost only once by a thin margin of 142 votes to Surinder Singh Kairon. Post-delimitation, the native village of Brahmpura too has been added to Khadoor Sahib constituency. The SAD has decided to bet on senior party leader Jathedar Tota Singh, thereby dropping three-time MLA and Chief Parliamentary Secretary Sheetal Singh. Peoples' Party of Punjab candidate Kuldip Singh Dhos and BSP nominee Gurnam Singh too matter a lot in the elections. However, all eyes would be on rebel Akali leader Sukhjeet Singh Kaka who won the SGPC election as an Independent after he was denied the party ticket. He recently joined the Congress and is said to have been promised the party ticket. Promises and projects: The ruling SAD ignored the constituency in the first four years of their rule but at the fag end of their term, the state government made Dharamkot a sub-division, which was a long pending demand of the people. Besides, the government recently showered crores of rupees on panchayats for rural development, besides laying the foundation stones of a few power grids. The Akali candidate has now promised to open a government degree college, improve the infrastructure, supply clean potable water in far-flung villages. Vox Populi: The local people here foresee a fierce battle for electoral supremacy between the SAD and the Congress. PPP candidate Kudip Dhos, who left the SAD, is likely to cut into the Akali vote bank while the BSP candidate is likely to affect the prospects of Congress nominee. LOOKING BACK: Sarwan Singh of the CPI had won the seat in the 1977 and the 1980 elections. In 1985, Gurdev Singh Gill of the Congress emerged victorious while in 1992, Baldev Singh Bhatti of the BSP was the winner. In the 1997, 2002 and 2007 elections, Sheetal Singh won the seat. Except for few meetings by some of the Akali Dal candidates, its work as usual in the royal city of Patiala, the home turf of former Chief Minister and Punjab Pradesh Congress Committee (PPCC) president Capt Amarinder Singh. Since, Patiala is stronghold of Congress and presence of SAD-BJP alliance is not much here, the election campaign will gain momentum only when Congress candidates will start canvassing. According to sources in the Congress, once the tickets are announced, all of a sudden Patiala will be abuzz with the political activities. "Though there is no final decision as to when the list of candidates would be released. The first list is expected to be out by January 2 evening and the second list by the end of first week of January", said a senior Congress leader of Patiala, while speaking to The Tribune over phone from New Delhi. Figures suggest that around 33 categorised VIPs and over 906 other individuals enjoy security as over 2,600 policemen are deputed to protect them in 25 police districts and UT. Since the district police is short of staff, these security persons could be called back by the EC to join poll-related duty. The security cover in the state has been categorised as “Z plus”, “Z”, “Y” and “X”. Officially, 33 VIPs in the state enjoy security as per these categories. However, there are numerous others who have policemen attached with them. While eight persons have the Z+ security cover, 16 have Z category, six Y category and three persons have the X category security cover. The Z+ category of security has been provided to eight heavily guarded VIPs. These are the Governor, Chief Minister, Deputy Chief Minister, PPCC chief Capt Amarinder Singh and SAD MLA Bikramjit Singh Majithia. As per the instructions of the EC, the Moga police has already shifted numerous police officials deployed for VIP security. “There might be more withdrawal of security persons in the near future as the earlier list has been revised and the EC could take a decision anytime,” said a former police officer. “There is always a threat that the security officials can be misused during the elections,” a senior police officer said, adding, “Around 2,600 policemen in total means 100 officials per district which roughly means 10 persons per police station in the district are busy protecting VIPs”. Enquiries by The Tribune reveal that more than 2,500 policemen posted in various districts of Punjab are unofficially attached with various politicians who use their clout and manage to get security from the SSPs in addition to getting security from the IRB, armed and commando battalions. Despite reminders by top officials, the policemen are never sent to their actual place of posting due to political pressure. Though, with election code of conduct in place, the state government cannot accept the demands of the employees, but still the employees said that as a mark of symbolic protest, they would hold a protest rally at Lambi. From first week till January 18, the TSU members would take out protest rallies in villages and cities of the state. Parmod Kumar, state general secretary of the TSU, said that post unbundling of the erstwhile Punjab State Electricity Board (PSEB), two power utilities, the Punjab State Power Corporation Limited (PSPCL) and the Punjab State Transmission Corporation Limited (PSTCL), were entrusted with the work to frame the service rules of the employees, afresh. Elaborating further, TSU president Sukhwant Singh Sekhon said, "The management of the power utilities is making certain changes in the service rules, which would lead to increase in workload and would be detrimental for the employees rendering technical services to both the power utilities. Also, ban on new recruitment has not been lifted." Sekhon further said that on compassionate grounds jobs were not being given to the kin of the employees, who died on duty. "The decision of the state government to recruit 5,000 unemployed linemen in power corporation is yet to see the light of day", Sekhon said, while appealing all union members to make the January 24 protest successful. Members of the power corporation management refused to comment on the matter. "Since the election code has been enforced, we do not want to make any statement", said a few officers of the power corporation management.